The Lighthouse Inn at Point Cabrillo is a charming oceanfront bed and breakfast located in the renovated & restored 1909 Head Lightkeepers House at the Point Cabrillo Light Station. Enjoy private night time guided tours of the lighthouse along with a five-course gourmet breakfast each morning. The Lighthouse Inn features six beautiful and unique period-furnished guest rooms, four upstairs in the Head Light keeper's house and two handicapped accessible Garden Rooms. All rooms have private bathroom, queen beds with luxurious linens, cozy sitting areas and private temperature controls. 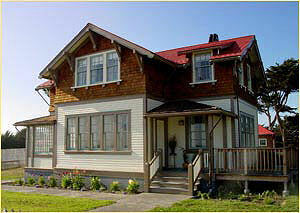 Whether your room overlooks the Nature Preserve, coastal headlands, or the Lightkeeper's gardens, all have ocean views.